A man in Upstate New York couldn't understand why he was getting pulled over. But when he did pull over he was shocked on getting cited for using a cell phone while driving when all he was doing was 'vaping' an electronic cigarette. Jason Dewing was ticketed for violating a law that doesn't exist. In New York though, there are laws prohibiting the use of cell phones and other electronic devices while driving. There are no laws that prohibit smoking a tobacco cigarette while driving. The officer who cited Jason wrote him up for using a cell phone. So when the case went to court things got interesting. According to this report on Examiner.com that managed to interview Jason over the phone, this is what happened. Vehicle & Traffic Law - Distracted Driving, Talking, & Texting Article 33 Section 1225-d: "Except as otherwise provided in this section, no person shall operate a motor vehicle while using any potable electronic device while such vehicle is in motion." A portable electronic device constitutes "Hand-held mobile telephone, personal digital assistant (PDA), handheld device with mobile data access, laptop computer, pager, broadband personal communication device, two-way messaging device, electronic game, or portable computing device." According to the law, an electronic cigarette isn't established as being a portable electronic device. In court: According to Mr. Dewing's account, he had to prove to the court that he wasn't using a cell phone while driving. When the officer who cited him took the stand, he couldn't say what color Jason's cell phone was which Jason says is a distinct shade of bright red and should be easily identifiable. Additionally, Jason used to work in loss preventions and used to do Private Investigation work. He was able to get his cell phone records subpoenaed for the court hearing, which helped him proved the only time he had used his phone was 8 miles before being pulled over, at a gas station. After matching the records the judge determined that Mr. Dewing was not using a cell phone while driver. But then the case took a turn. The court went after him for using the electronic cigarette. Jason was asked whether he knew what the 'e' in e-cigarette means. 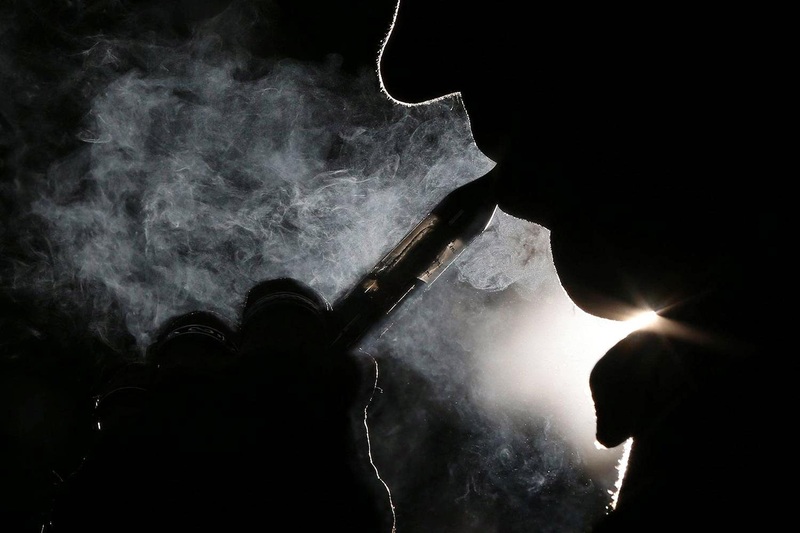 On saying 'electronic' the judge told him he was using a portable electronic device which is a violation of law 1225-d.
Jason tried telling the judge that electronic cigarettes are not classified as portable electronic devices under the law. Apparently, the District Attorney had to look up the law to determine the specifics. Unfortunately though, it was a little too late as the court had already found him guilty of violating law 1225-d. The judge told Jason that if he had made the court aware of the law before he made a ruling, he would have dismissed the ticket. So now the only way to overturn the ruling was to go to appeals court. The ticket was issued back in November, 2013 and the case was heard in court on March 20, 2014. Mr. Dewing had 30 days to appeal. It's not certain on whether he did but he did suggest that it was already a sort of victory for him when the judge told him the ticket could have been dismissed.